Sweet, smoky, savory, packed full of umami, and, oh yeah, bacon. In. Every. Form. 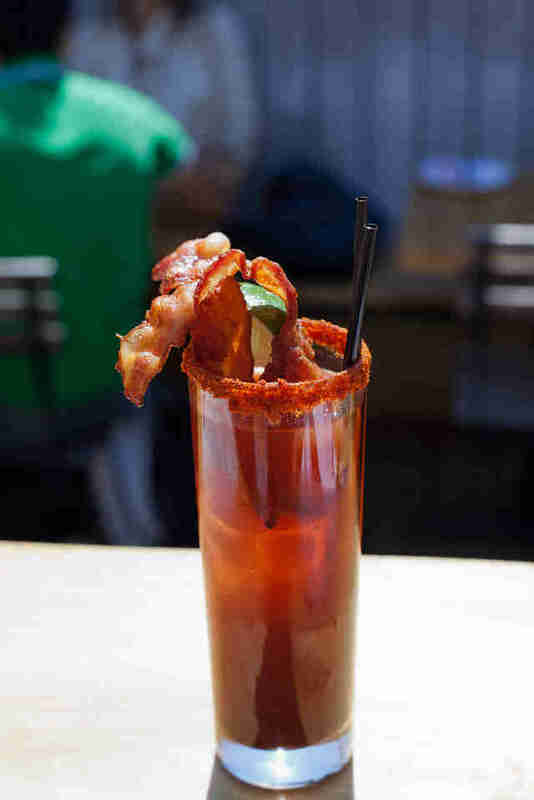 We’re talking about bacon-infused maple Crown Royal, and bacon-infused Worcestershire, that’s been added to chipotle Tabasco, liquid mesquite, and Clamato in a glass that’s rimmed with crushed bacon and garnished with candied bacon strips. The city’s newest watering hole, it’s across the way from where South of Temperance used to be and a 3,500sqft patio is slated for this Summer. 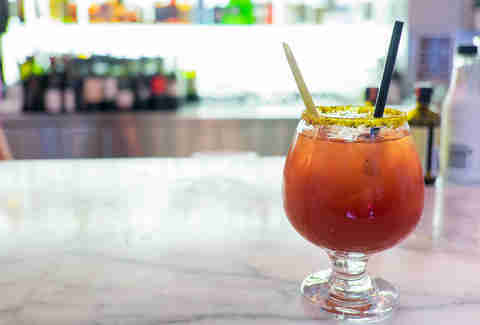 Their version of this cocktail uses a Canadian craft Caesar mix (Walter), mixed Italian spices, and is fortified with a bouillabaisse that’s made specifically for the drink by the kitchen. No small stuff for that matter; it’s lobster stock, shrimp shells, chili, onion, and garlic. 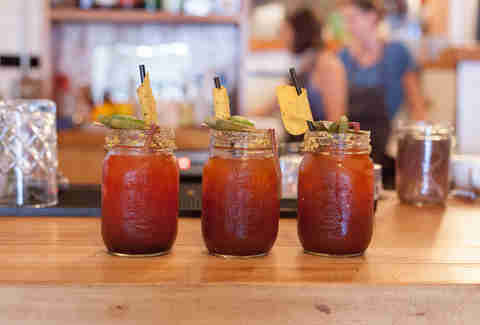 Once assembled, the drink is shaken (not stirred), then finished with a pickled green bean, and fresh ground horseradish. Classic. 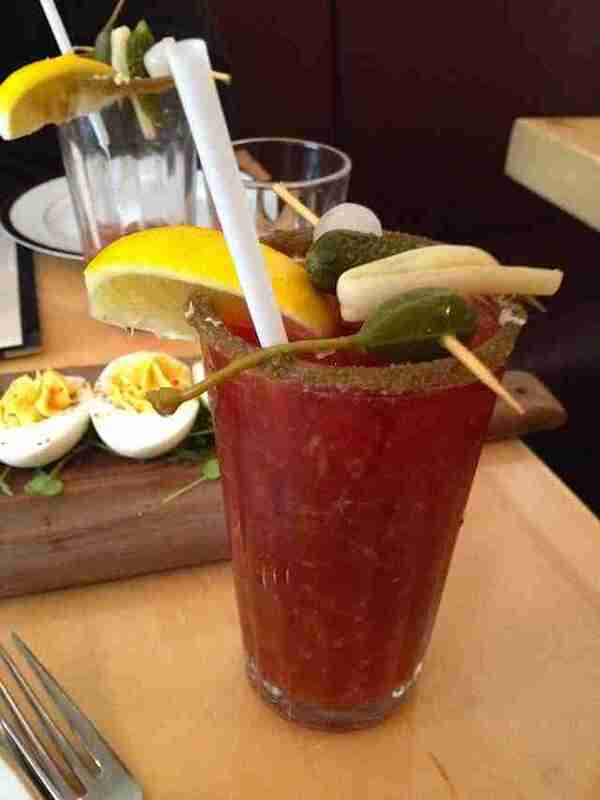 The restaurant’s top-notch, feel-good grub is matched by similarly feel-good libations, including a Caesar in its purest form: vodka, Walter mix, fresh horseradish, tabasco, Worcestershire, celery salt, and lemon. The only sort of craziness here is in the house pickles; superb specimens that might include a pearl onion, cornichon (that’s a small pickled gherkin), long bean, and a fat, juicy caper berry. We said pure, not boring. Seafood. Canadiana. Booze. 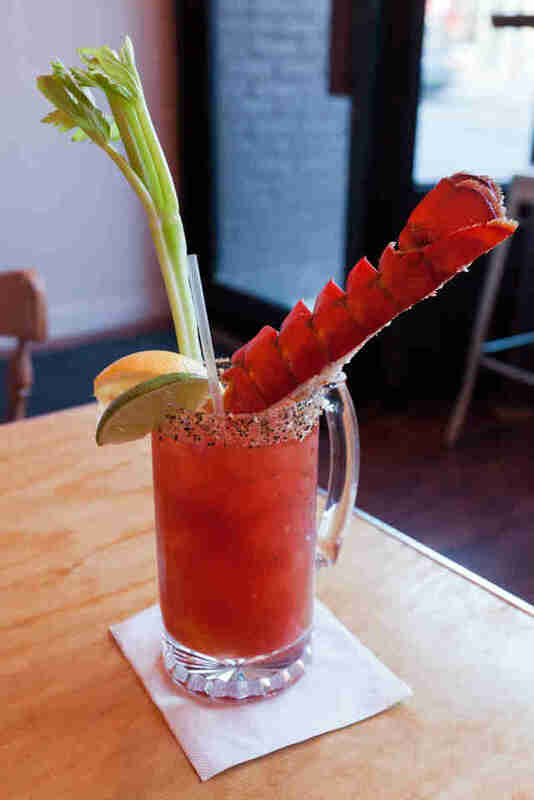 It’s not just how owner and Chef Matt Pettit bills his restaurant concepts, but it also describes the restaurant’s signature Caesar, sporting a kicked up “Toronto” steak spice rimmer, and a split Nova Scotia lobster tail garnish plucked out from the restaurant’s stocked raw bar. 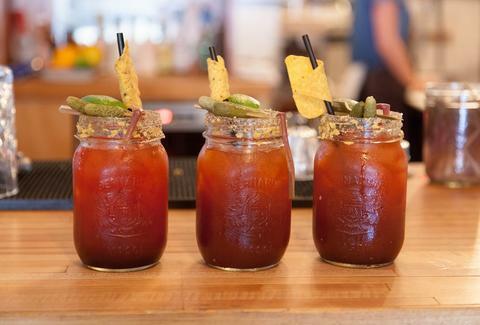 Awesome brunch and late-night snacks are the specialties at this space on Dundas West. How awesome? Check out their Caesar: a DIY number that gives you the power to spike your Walter-based drink with Bombay gin, Iceberg vodka, or El Jimador tequila. The kicker is the rimmer and garnish: Cool Ranch Doritos! 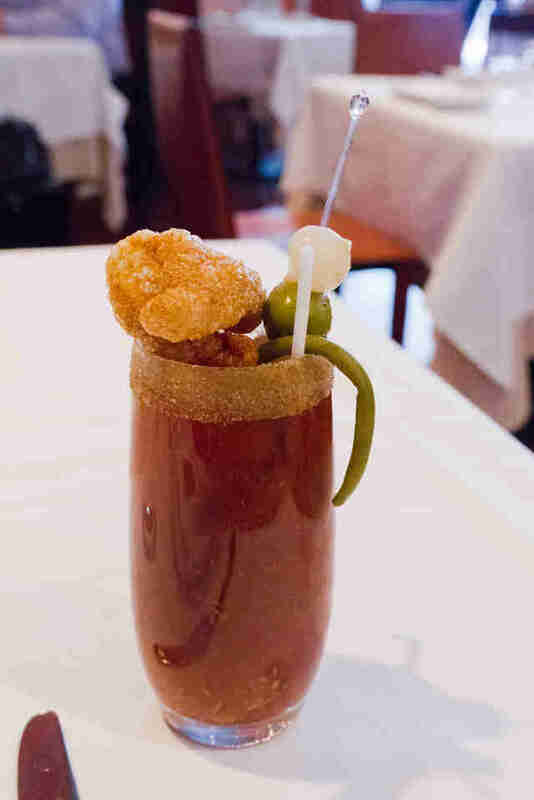 This sucker's got both spiced gin and vodka, a proprietary Caesar mix (from ex-little sister, County General), and is garnished with house pickles, olives, and mammoth chicharróns! It’s extra crispy, extra porky, and extra spicy (option shown here). 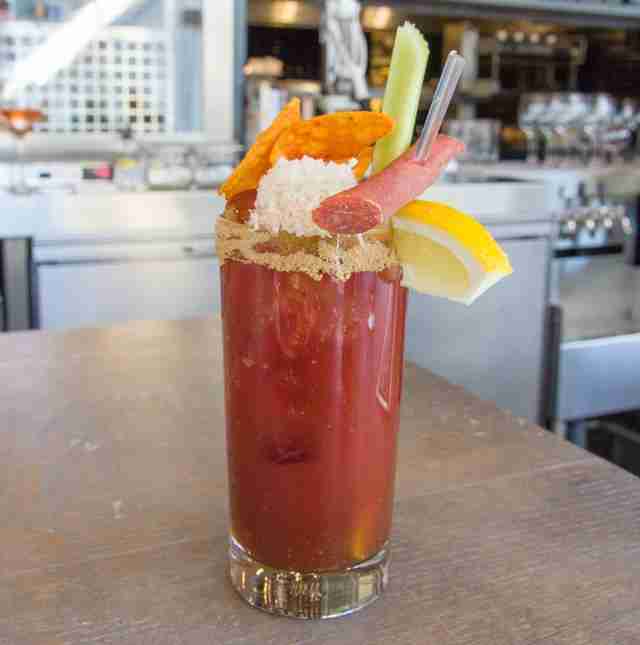 It’s too bad it’s only available at Sunday Brunch (but that’s when you can get this). Don’t let the pretty name fool you, the newest Caesar at this after-work spot packs a punch -- it's a flavourful mix of saffron & basil-infused gin, Walter mix, horseradish-infused vodka, and habanero & cilantro-infused BBQ sauce. Fresh cucumber and salt bitters keep things simple and cool, and you can have one on their massive wrap-around patio. 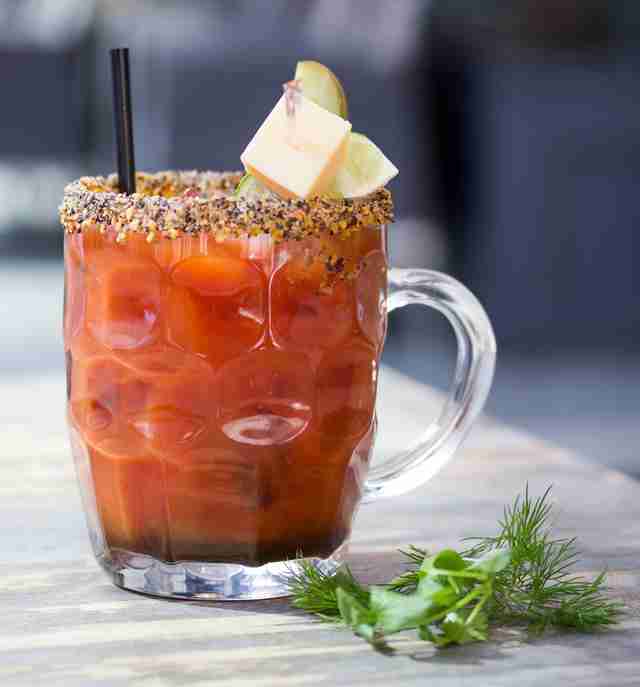 While this neighborhood smokehouse serves three Caesars, including a vegetarian version and the original (made by Christopher Johnson, aka the last bartender to sling drinks at Marco’s Italian, where the drink was invented), it’s the gilded Big Smoke that’s got folks bowing in reverence. 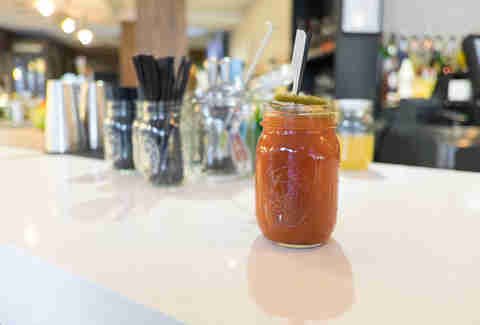 The 20oz beast contains a double shot of house-smoked pepper and chili-infused vodka, house-seasoned Clamato, and Louisiana Gold hot sauce. It’s christened with a squeaky cheese curd, house triple-smoked bacon, a sweet sandwich pickle, smoked pepper, and lightly smoked shrimp. It’s Asian-inspired; but less fusion, and more light and floral. It’s also why the gin-wasabi Caesar is served in a snifter glass (for the aroma, of course) with a pucker-inducing lemon pepper rim. The herbal flavours are bolstered with the addition of lemongrass and soy sauce, and then rounded out with a splash of Clamato and fresh lemon juice. It’s great for the warm weather that Toronto will get, eventually... right?! It’s a checklist of a million possibilities (well, more like 70,308. Yes, we calculated it.) 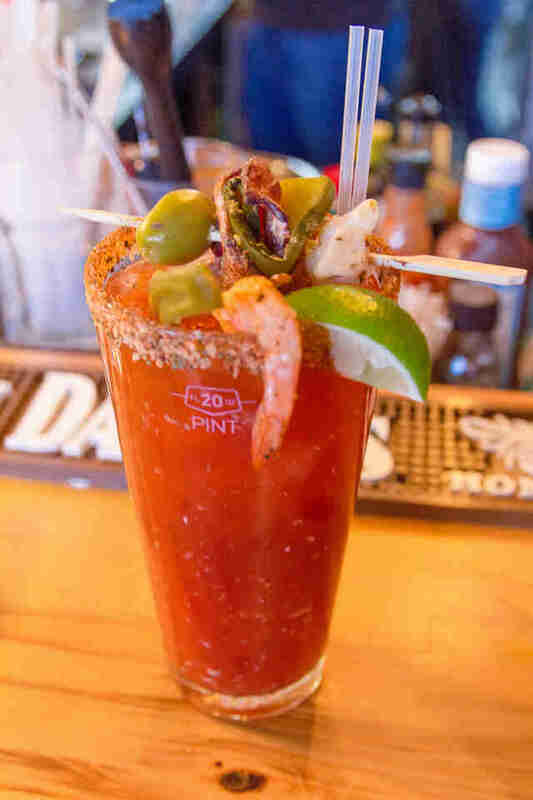 that includes four rimmers, three base spirits (choose from vodka, bourbon, or tequila), a trio of hot sauces (including one that may entice or scare called "Burning Desire"), and a variety of condiments and garnishes. This one is rimmed with kimchi, and made with vodka, sriracha, horseradish, then garnished with a stalk of celery, Doritos and a D. Martin pepperette. 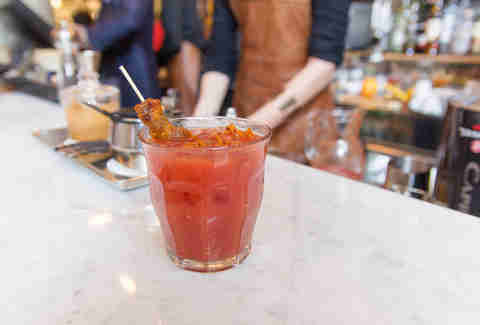 The absence of Clamato makes it more a Caesar in spirit than fact, but the brunch-time-only cocktail at King West’s latest and hottest all-day bar mixes Ketel One with house-pressed tomato juice, and house-made hot sauce, before being finished with a couple of pieces of fried pork jowl. It’s simple, savoury, and delicious.